Hello, I'm Chris Vermeulen founder of TheGoldAndOilGuy and NOW is YOUR Opportunity to start trading GOLD, SILVER & OIL for BIG PROFITS. Let me help you get started. Sector timing commodities - Being able to trade different sectors is crucial for making a living in today’s financial markets. 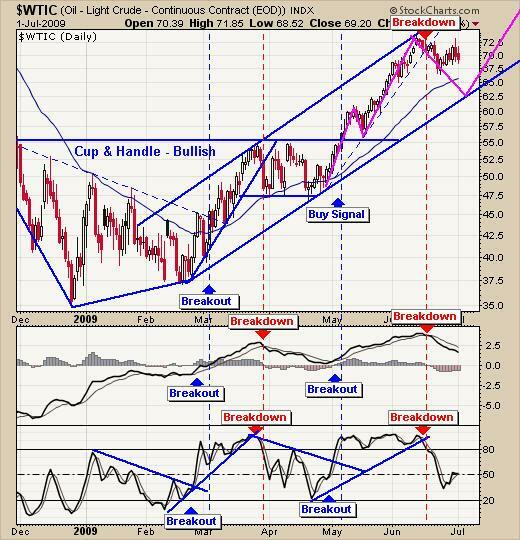 One sector that cannot be over looked is the commodity sector. Timing this sector can be a very profitable venture if executed properly. In the past commodity trading was seen as a high risk investment because of the leverage involved with purchasing futures contracts. A small wrong move in a commodity, and a trader/investor would be holding either a nice gain or a nasty draw down (loss). With the recent creation of ETFs everyone can trade the commodities market and select the level of leverage they are comfortable with. 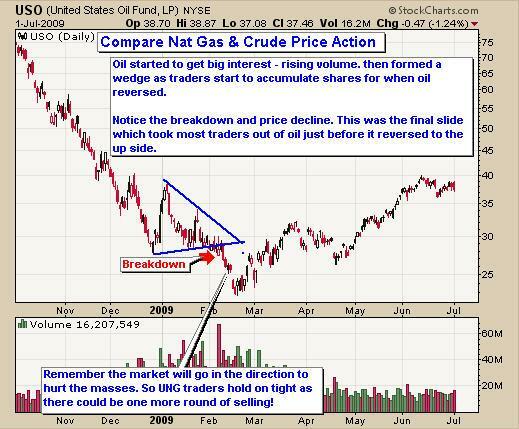 Funds range from 1 to 3 times leverage of the underlying commodity. In this report I cover the basic funds for gold, silver, oil and natural gas which have the least amount of leverage available. It is important to know that my trading signals for these commodities work for any of the leveraged funds as well, for those who like really explosive short term trades. I will admit, GLD is my ATM machine. I have been trading this since the day it became available. While I do not get a tone of trades per year from it, it does produce excellent low risk trades time and time again. Gold pulled back to our support trend line as expected and posted in my Sunday night report. 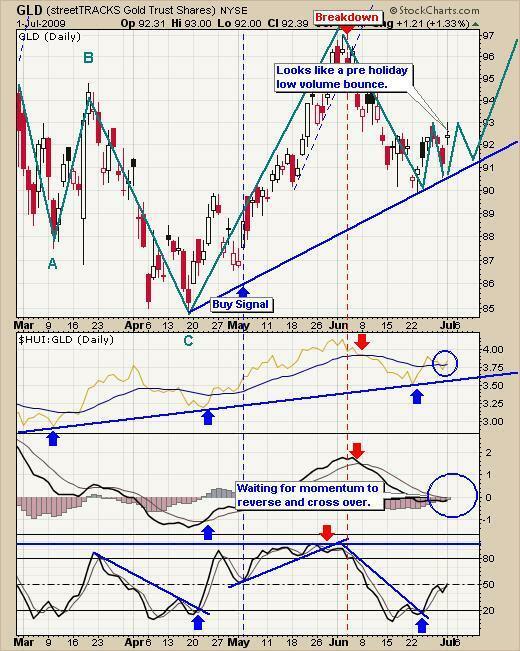 The chart looks awesome for a buy signal but I am waiting for a MACD cross over before jumping on the band wagon. I like momentum to be on my side as it helps confirm the reversal putting the odds even more in my favor. Today was a quite day with the Canadian market closed and the US holiday weekend only a day away. Volume was light today and it will be even lighter tomorrow. Generally stocks and commodities rise on low volume days pre-holiday. I would like to see gold pullback to allow for a quicker low risk entry if possible. Silver has had a sharp pullback as expected this past month. It looks like we are getting closer to a possible bottom here in silver but still a few days away just from looking at the MACD. Let’s wait and watch this unfold next week. Oil is trading at the mid way point of is trend channel. It could go either way here but recent price action is pointing to lower or sideways price action in the near term. USO has had a couple technical breakdowns recently. The daily and weekly charts signaled profit taking which is shown. After the recent breakdown in oil, prices have drifted higher testing resistance Tuesday and Wednesday. Sellers came out of the wood work pulling prices back down. This is very bearish price action especially because volume increases on these days. This could be a good entry point for short position but I do not recommend shorting a commodity which is in rally mode. 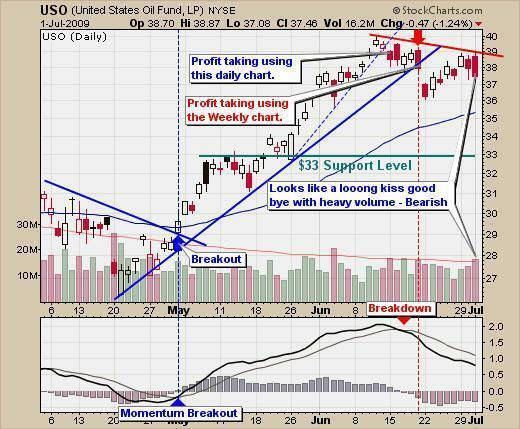 This is a chart of oil (USO). 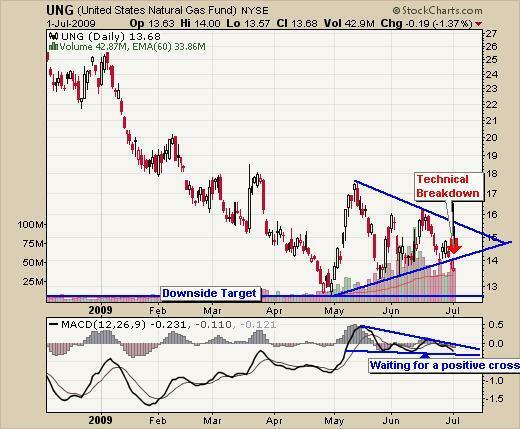 If you look at the price action and volume you will notice it is very much the same as what we are seeing in Natural Gas (UNG) chart below. I know how popular and excited everyone is to buy gas before it reverses but if things pan out the same way that oil did. A lot of people are going to take a beating if they cannot handle a large draw down. The market works in mysterious ways and will move in the direction that will hurt the largest number of traders. That being said many of these moves can be avoided or taken advantage of depending on how much risk you can handle and how active of a trader you are. Nat gas has been on my radar for several months as I wait for a low risk entry point which generally occurs at the beginning of a new trend. Using my trading strategy I can avoid most of the noise in various sectors, stocks and commodities and put my money to work when the odds are in my favor. We continue to wait for a low risk setup in Nat Gas as well. In short all of these commodities are trading at different cycle points. 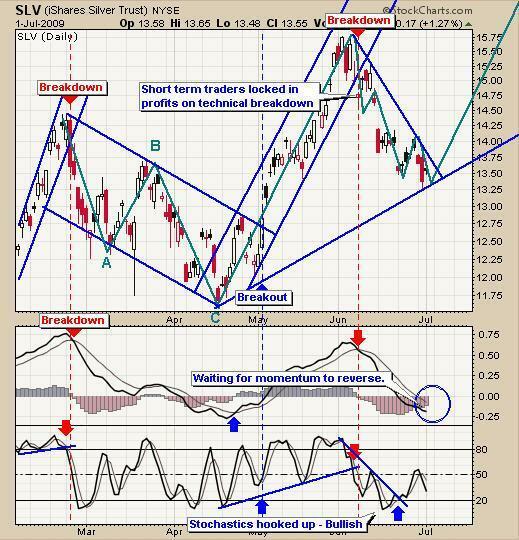 Gold looks to be bottoming short term and ready for a small rally. Silver is still sliding lower trying to find a bottom. Oil has had a great rally and now starting to roll over. Natural gas is starting to bottom from a massive multi month sell off. I do not know when exactly we will have buy signals but I am sure they are not far away. Overall I think gold will hold its value as the equities market and the US dollar are starting to look weak. NOW is YOUR Opportunity to start trading GOLD, SILVER & OIL for BIG PROFITS. Let me help you get started. I have put together a Recession Special package for yearly subscribers which is if you join for a year ($299) I will send you $300 FREE in gas, merchandise or grocery vouchers FREE which work with all gas stations, all grocery stores and over 100 different retail outlets in USA & Canada. If you have any questions please feel free to send me an email. My passion is to help others and for us all to make money together with little down side risk.